Andis GTX Trimmer Review: Are They The Best? A lot of you guys mentioned that we haven’t given Andis GTX T Outliner the proper love it deserves in a standalone review. That may be right: we did write an extensive T Outliner review. We also compared the GTX and Wahl’s Detailer. And I’ve mentioned it before – to me, the GTX is the best Andis trimmer out there. I’ll explain why it outperforms both the standard Outliner and the T-Edjer too. It’s high time I did a full Andis GTX trimmer review. Starting out with a kick, the GTX trimmer will charm you with its black-themed elegance. The standard T Outliner is not bad, but its grey body was always a bit dull to me. Clad in stylish, tough polymer, Andis GTX measures 5.5″ and weighs 0.7 lbs. Let’s be honest, 0.7 lbs is a bit heavier than your traditional trimmer. However, I like it. You get a proper grip with that thing, I’m not that much of a fan of lightweight hair cutting tools. Speaking of Andis GTX vs T Outliner, a big difference with this black beauty is the cord. The standard T Outliner has your usual 2-pronged cord of medium thickness. The GTX trimmer comes equipped with a 3-pronged, extra thick cord. It feels more solid, regulates the tool’s movement better and, you know, just feels manly. It’s also safer due to the grounding element. Keep in mind it adds a little bit to the trimmer’s overall weight. As far as accessories go, most sellers should ship this Andis trimmer with 4 attachments. Starting with #0 up to #3, you’ll get 1/16″, 1/8″, 1/4″ and 3/8″ trimmer guards. For other countries, that’s 1.5, 3, 6 and 10mm respectively. You also get the usual blade oil too. It really is. The blade you’ll find with this neat Andis machine is the reason why I consider this the best T blade trimmer overall. Neither the standard Outliner or the T Edjer can match it, really. 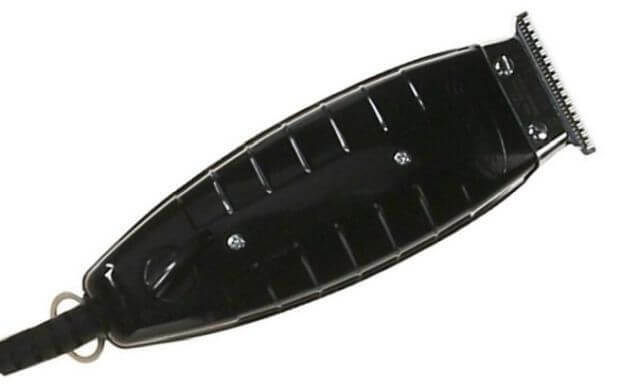 The black Andis T Outliner features a blade with deeper teeth. 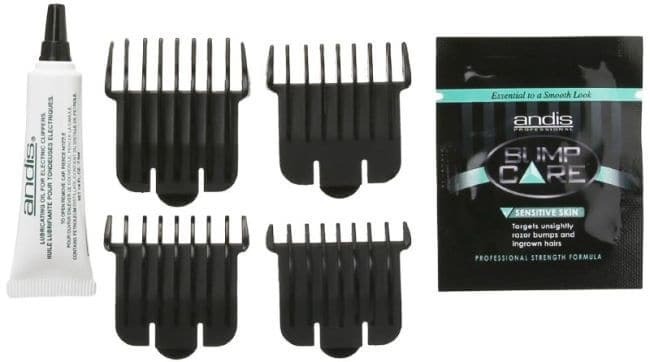 What this effectively means is that it’ll cut longer and thicker hair types way smoother than other T Blades. Anything from casual trimming to detailing or doing a fade will be simply superior to what you’d achieve with the standard T Outliner. Notice the depth of the blades? Almost twice as much as the standard grey Outliner with a T-blade! The GTX blade is also quite good for sensitive skin. Its carbon-coated steel will stay sharp and strong for a long period too. I mentioned that to me, this is the best Andis trimmer and the best T blade trimmer overall. Why? The answer is…versatility. First of all, the GTX “engine” allows it to go hard. Andis electromagnetic motors put in their high end trimmers clock at 7200 strokes per minute as buyers’ reviews praise on Amazon.com. Let me tell you: this is pretty, pretty strong. Combined with the deep tooth blade, you can perform anything from outlines to edge ups, beard or sideburn trims and neckline cleanups. Needless to say, this is an amazing trimmer for bald fades or general fades too. Wondering about Andis T Edger vs GTX or the standard T Outliner vs GTX? Here’s your difference: this model’s trims are more precise, more powerful and simply better. OK, first of all, I want to say that many of you will want to zero gap this model eventually. And as I’ve mentioned before, doing a zero gap on Andis trimmers and clippers can be a bit tricky. The Wahl Detailer, for example, is way easier for this kind of tinkering. Second, the GTX T Outliner doesn’t overheat as easily as the standard model. However, it will still get hot around the 15 minute mark or so which might be faster than other models. Think about it, though – this Andis trimmer has a 7200 SPM motor monster. Do you really expect it to stay cool or quiet all the time? That is simply naive. Your trade off here is the sheer power and detailing potential you get. 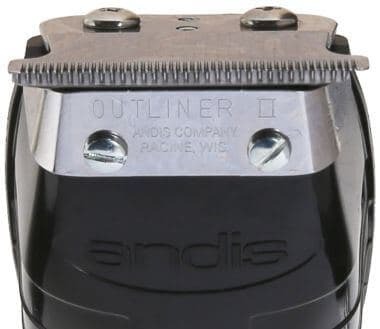 So base from this Andis GTX trimmer review, I’ll say it again and again: this is the best Andis trimmer, the company’s finest. Sure, for some people it might feel too robust, but for most, this machine will be an insane addition. The deep tooth blade to style thicker/longer hair better, the solid 3-prong cord that balances the GTX trimmer’s movement, that motor power…The black Andis T Outliner is a must for both barbers and people just seeking quality grooming at home. I hope you liked this Andis GTX trimmer review I made. The GTX outperforms every other Andis trimming tool. And, just my personal preference, it also qualifies as the best T blade trimmer on the market. You can’t go wrong with it. Can you put a GTX blade on regular T outlines? Note that it won’t work on Slimline Pros/Pro Lis or Styliners, though. I have a similar (?) to the question asked previously. I understand I can add the GTX blades to the standard T outliners. I don’t have long hair so do you think it’s worth it adding the new blades to the standards? Also, excluding the stability, better motor and deeper teeth for long hair is that the only drastic difference between this and the standards? Also, I am just now learning to cut my hair at home, I’ve learned how to set the blades very sharp so do you think cutting with the smaller square blades on Andis II would be easier for my circumstances? Hi Malik! Not a long message at all! Do you have extra thick hair? In my opinion (Ryan’s too, I think), most of the time going the GTX way is for those who have veeery thick hair, as the deep blades cope better with it, compared to the standard T-Outliners. Yes, the deep blade and the 3-pronged, thicker cable (stability) are the only differences. T-Outliners and the GTX actually have the same (7200 SPM) motor, so no difference there. The square blade is indeed a bit more beginner-friendly, but as long as you don’t overdo it with making any Outliner blades sharper, you shouldn’t have a problem there either. The whole lineup is great for more sensitive skin, I currently use a standard T Outliner for my neckline, sideburns and dry face shaving. Just remember to not push the Outliner too much as it can nick skin in these cases. Let us know if you need any additional info! Hey, what’s up Alex. I appreciate the response, I’ve definitely been treating this site like the Bible lol. I’ve even recommended for others I know who want to learn. No, I don’t have thick hair it’s not silky either as I am a black male lol but it’s a decent grade so thanks for clarifying I see now I won’t need the GTX. I noticed one of the recommended guards on the page is the magnetic combo purple pack but I read a lot of reviews stating the magnets fall off rather quickly or even worst come with the magnet missing. 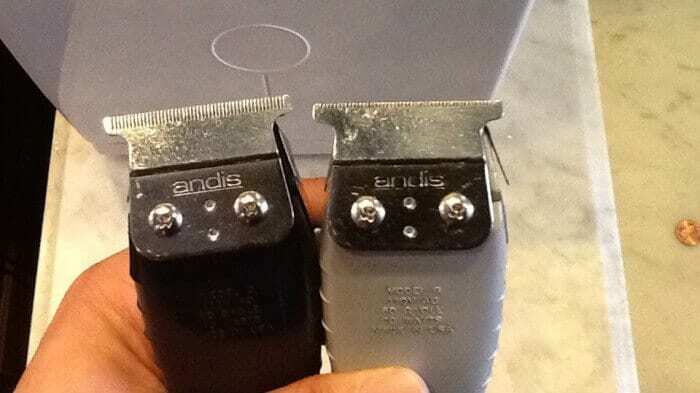 Do you think it’s best I go with the vintage red ones that clip on for the Andis Masters Clippers. Lol I might as well get in all questions while I can since you respond. I have the Andis Masters and T Outliners with no guards as a beginner for self cutting is there anything I’m missing that’ll help me on the list. Hi again Malik and thanks for the kind words, appreciate it! Oh, good on clarifying on the Master, I thought you want to use the purple guards on the T Outliner and was worried for a bit! You mean the red Speed-o guards, right? I think generally Nano (purple) are sturdier and have a better fit. I too have heard of isolated cases with faulty Nanos, but you should be able to get a return on them if it happens so, right? Most barbers we’ve seen (Ryan’s preferences also) lean towards the purple Nanos over the Speed-o. Now, your personal experience might vary, but I’m voting purple this time! Masters is a good choice, though their metal might feel heavier if it’s your first clipper! I think you’re set – just remember to grab some clipper oil, a cleaning spray and a hand mirror so you can look at the backside of your head for optimum results! It should do a great job, judging from my personal experiences. Both the standard Outliner and the GTX version are great for both facial hair and the stubborn thicker/curlier hair types too. Also good for sensitive skin, if your SO has problems with this. I think Andis include a small sample of bump-free cream with the usual GTX packages too…might vary across merchants. I just bought these on your recommendation. I got these brand new on amazon and noticed the inner blade has some very slight movement/play that causes it to be slightly misaligned. Is this normal for clippers in general or is it possible I have a defective model? It really depends on how little the movement is. I’ve definitely had some clippers that moved a little – but it was so insignificant that it didn’t require any blade aligning. Did you test the GTX out? Do you feel it fails to cut hair properly or snags it? If it does, then that’s definitely a misaligned blade you’ve gotten. You can either try to align )adjust) it by yourself, or send it back for a return. It’s for the T Liners, but the general process is the same! It’s maybe one of the most concise and easy to follow videos on the topic. Just make sure you’re not zero gapping it (the video focuses on adjusting only anyways)! Hey I’m a little great question because today I was literally looking at the back of both my gtx and regular t-outliner and noticed gtx says 110 volt but 12 watt while the regular says 110 volt and 10 watt…So ur good I highly doubt fakes even exist….I used my regular outliner 90% of the time because the gtx is a knuckle head for some reason ….peace hope I helped!